"D[eath] William Whitney Deceas^d in Weston y^e 24^th Day of June 1720." Mary Frances Peirce, Town of Weston. Births, Deaths and Marriages, 1707-1850. Gravestones-, 1703-1900. Church Records, 1709-1825. Appendix and Addenda, Centennial Society (Boston, Mass. : McIncloe Bros., Printers, 1901), page 10, William Whitney death entry. 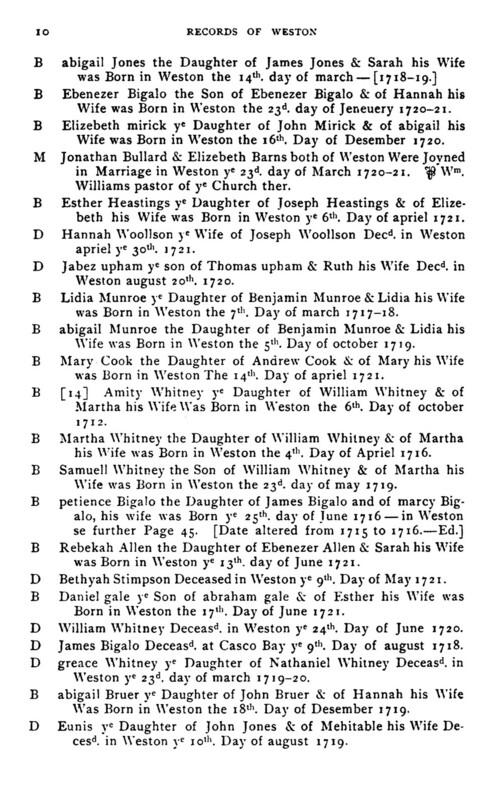 William Whitney was born 6 May 1683 in Watertown, Massachusetts to Nathaniel and Sarah (Hagar) Whitney. He married Martha Peirce on 17 May 1706 in Watertown, Mass. They had five children between 1707 and 1719, including Samuel Whitney (1719-1782) who married Abigail Ffletcher (1720-1783) in 1741 in Weston. William and Martha (Peirce) Whitney are my 6th great-grandparents.